More than 1.6 million elderly and disabled people are now living in our nation’s nursing homes, Certified Nurse Aides or CNAs are their primary caretakers. Becoming a CNA in Louisiana can be an exciting and rewarding career. This guide will show you the ins and outs of how to become a CNA in the state. You will learn about the different certifications routes, CNA training, the certification exam, certification renewal, and your potential career future as a Certified Nurse Aide in Louisiana. There are several routes available if you want to become a Louisiana Certified Nurse Aide. The criteria for each route is a little different, so you should pay attention to which one best matches your situation. If you’ve never been a Nurse Aide, attended any nursing schools, or worked in the medical field at all, this is the route for you. Becoming a Certified Nurse Aide in Louisiana requires that you go through a training program approved by the Louisiana Department of Health and Hospitals (DHH). More information about approved Nurse Aide training programs in LA will be given later on, but there are a few basics you should know about in order to receive certification. If you are wondering what a CNA is, the DHH defines a Certified Nurse Aide as someone that has successfully completed an NATCEP program, and that meets all the conditions laid out in the Code of Federal Regulations (CFR), Title 42, 483.151 through 483.154. These Federal Regulations explain the minimum requirements for training and testing that each state must follow. Louisiana requires each candidate to have a minimum of 80 hours of course instruction. Half of those hours will be spent in the classroom, and the other half will be spent in clinicals. Once you’ve successfully completed your course with the required number of hours, you will be eligible for CNA testing including a written (or oral) examination and a skills evaluation. There will be more information about the Nurse Aide state exam later, but for now just understand that in order to be certified in the state of Louisiana you must pass both the training program and the test. Otherwise, you will not be able to get into the Louisiana Nurse Aide Registry. Perhaps you’ve had some medical training in the past, or have even been a Certified Nurse Aide. Either way, the steps involved for you would be a little different than those for new candidates. The types of alternative certification that are approved by the state of Louisiana are licensed nurses, nursing students, or military members who have medical training. However, some states do not have an online CNA verification system. If this is the case for the state you’re certified in, then there is an extra step involved. You will have to mail your completed reciprocity form to your state’s registry, and they must complete the bottom half of the form. You’ll need to do this for all of the states you are certified in that don’t have online verification. Once that is complete, you will mail the same documents mentioned above, to the exact same address. You may have had CNA training before, and for whatever reason, have failed to meet the minimum requirements for recertification. The process to get back on the CNA registry is fairly straightforward. You are allowed to take the NNAAP examination once to recertify, and you must pass both parts of the CNA state test in order to qualify. This has to be done within the 2 year period after your CNA certification has expired. If it has been longer than the allotted 2 years, or you have failed any portion of the exam, you will have to go through another Certified Nurse Aide training program in Louisiana. 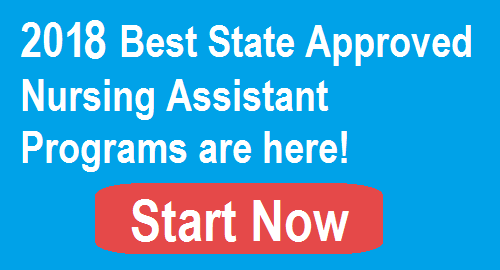 After successfully completing it, you will also have to pass the state exam. You will need to contact a DHH approved tester, such as Pearson VUE, to determine the cost and schedule the test. In order to really understand how to get CNA certified in LA, you’ll need to know the following sections about the required certification training and the exams. You will have to take a program at one of the DHH-approved Nurse Aide Training schools. CNA programs can be run out of high schools, nursing homes, community colleges, and other teaching institutions. A high school education is something that is recommended before beginning CNA training in Louisiana, but it is not necessary. CNA classes in Louisiana are designed to prepare you for tackling real-life scenarios in the healthcare field. You’ll be required to take at least 80 hours of training. Half of these hours will be in the classroom and the other half will be clinical training. If you receive your training in a nursing facility, you must have at least 16 hours of instruction before you can provide direct care to a patient. If you take a non-facility based program, you must have at least 32 hours of instruction before you interact with a resident, including 16 hours of training in the classroom and 16 hours of supervised skills training. Training programs generally do not last longer than 3 months, and some can be completed in as little time as 6 weeks. It all will depend on the pacing of the course. So make sure that you research and find out which course is best for you and your timetable. CNA programs are not terribly expensive. According to 42 CFR 483.152, if you are a CNA that is either employed by a facility or has an employment offer from one when you begin your training and competency evaluation program, then you cannot be charged for any part of the program. Additionally, the same CFR mentions that if you become employed by a facility within a year of finishing your training and certification, then the state will provide reimbursement for the costs incurred on a pro rata (proportional) basis. If you do not meet either of these requirements, the costs for a CNA program at a community college or technical school in Louisiana is typically around $2,000. Often the institution that hosts your training program will offer some type of payment plan or financial assistance. There is quite a bit of curriculum that you’re required to learn in order to be qualified as a CNA in the eyes of the State. Below is a condensed list of the CNA curriculum. If you are interested in the full list, you can find it online. Once you have successfully completed your training program, the next step is to pass the certifying exam in Louisiana. The National Nurse Aide Assessment Program (NNAAP) exam is the one you will have to take in order to be listed on the CNA Registry. If you have recently completed a Nurse Aide training course, then you will have three attempts to take and pass this test before you are required to take a training program again. If you already know a lot about the testing process, then you can skip ahead and try a practice test to ensure that you are really prepared to pass the CNA exam. Otherwise, you can continue reading to find out what the test will look like. The Louisiana NNAAP examination is made to test the knowledge you’ve learned during your time in training. The state test has two parts, a written examination and a skills evaluation. You will have to take both parts on the same day, and you must pass both portions of the test in order to be certified as a CNA. The written examination is designed as a 70 question, multiple-choice test. However, upon request, the written examination can be substituted for an oral examination. This is for those who may struggle reading English, although you will be required to identify a few words that are commonly used in CNA work. The best way to find out if an oral or written examination is best for you is to take the self-assessment reading test found on page 8 of the Candidate Handbook. The second half of the CNA test is the skills evaluation. The test replicates an actual scenario you could face in your work as a CNA. You’ll be supervised by a Nurse Aide Evaluator, who will have you perform 5 randomly selected skills with 25 minutes. These are all skills you will have practiced during your training class, and there are 22 skills that are in the pool. One of the tested skills will always be hand-washing, and another will always be some type of measurement skill. You’ll have to execute all 5 skills successfully to pass the skills evaluation. For more details about the CNA exam in Louisiana, test tips, and the testing process in general, visit the Pearson VUE Nurse Aide Candidate Handbook. Before you apply for the NNAAP examination, you should make sure that you have completed either a training program or qualify under one of the routes described in Step 1. The fee for testing is $140, and there are only two ways to schedule an exam in Louisiana. Either someone from your training program will set it up, or you will have to call one of these two numbers: 337-474-1544 or 225-301-5504. Unfortunately, there are currently no online alternatives. The identification you bring cannot be expired, and there are only a few kinds of I.D. that are acceptable: a driver’s license, social security card (with signature), photo-bearing credit card, state-issued I.D., passport, and alien registration card. Other forms of signature-bearing identification may be acceptable, but make sure that you double check with the testing center if you decide not to use one of the mentioned I.D. forms above. If you show up without the correct identification, you will not be allowed to take the test and you won’t be refunded. After testing, your results (for both parts) will be faxed at the end of your test, or the end of the exam day, to be graded. Once graded, the results will be faxed back and given to you. This means you should know whether or not you passed the CNA exam on the same day as the test. If there are any technical problems with the faxing, your results will be mailed to you. This typically takes 5-7 business days. If you fail one or both portions of the CNA test, you will need to retest in order to be certified in Louisiana. Failing both parts, or even just one part, of the test three times will require you to enroll in another CNA training program. However, you do have a full 2 years from the date you completed the course to successfully complete the exam. Therefore, if you need a little extra time to study, don’t be afraid to take it. Once you have successfully completed your Certified Nurse Aide training and testing, you’re ready to be listed in the Louisiana Nurse Aide Registry. The Louisiana Department of Health and Hospitals (DHH) maintains the Louisiana Nurse Aide Registry and is required to have your information on file, such as your name, address, place of employment, CNA certification number, and so on. It’s best if you keep your information up to date, as it could cause complications in your recertification if you fail to do so. In some states, CNAs must pay a fee to renew certification. However, in Louisiana, your Nurse Aide Registry renewal is free of charge. If you pass the CNA verification for the work requirement, you will automatically be recertified. In order to meet the work requirement, you must have worked at least 8 paid hours in an approved setting during the past 2 years. If your employer has not reported your work history to the Louisiana CNA registry, ask your employer to report it. Otherwise, it may complicate your CNA certification renewal. Hopefully you’re able to work in the CNA field long enough to keep yourself certified, but if your certification lapses there is no reason to toss out your CNA certificate. If it has been less than 2 years since your certification has expired, you will have a one-time opportunity to retest. Once you pass this test, you will be recertified and eligible to work again as a CNA in Louisiana. Failing either portion of the state test, or missing your 2 year window, means that you will have to retrain in a state-approved program. After you’ve trained, tested, and become certified, you are now ready to begin working as a Certified Nurse Aide in the state of Louisiana.